Some sugars are unavoidable. Fructose in fruits, maltose from grains or even lactose from milk are naturally occurring sugars that aren't generally a big concern in your diet – these foods have other nutrients to offer. But a cube of sugar doesn't provide anything other than glucose, and thus calories, for energy. Even though natural sugars have the same number of calories as granulated sugar from a sugar cube, gram for gram, added sugar isn't something you want a lot of in your diet. For each gram of sugar in a food, you'll get 4 calories. 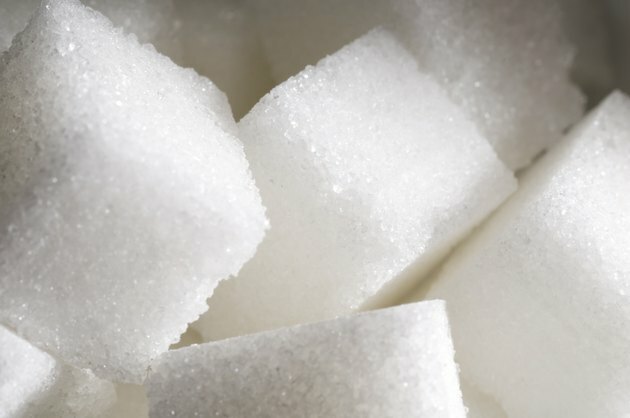 One cube of sugar weighs 2.3 grams and has a total of approximately 9 calories. All types of sugar have the same number of calories. Whether you're eating a cube of granulated sugar, honey, corn syrup, dextrose, maltose or other types of sugar, the calorie count is the same per gram. Too much sugar in your diet can lead to weight gain, which ups your chances of developing chronic diseases. It's added sugars from processed foods, however, that's the major concern because these junk foods offer minimal nutrients. Limit yourself to no more than 100 calories from added sugars daily, which is about 25 grams, if you're female. No more than 150 calories in your diet -- 38 grams -- should come from added sugars if you're male, suggests the American Heart Association. Depending on which group you fit into, just one cube of sugar takes up 6 percent to 10 percent of your added sugar allotment for the day. All types of sugar, added or natural, are carbohydrates. So if you do decide to have a treat with added sugar, you'll have to account for it in your overall carb intake. Around 45 percent to 65 percent of the calories in your diet should come from carbohydrates, as stated in the the publication "Dietary Guidelines for Americans, 2010." If 2,000 tends to be your daily average, you'll need 900 to 1,300 calories from carbohydrates, or 225 to 325 grams. If you pop just one cube of sugar into your morning coffee, it takes up less than 1 percent of your daily carbohydrate allowance. But those are empty calories, since you won't get any fiber, vitamins or minerals from sugar. While all sugars have the same calories, not all affect your blood sugar the same way. Most carbohydrate-containing foods have a glycemic index ranking, or GI, which rates foods based on how quickly they raise blood sugar. Foods with a score over 70 can elevate your blood sugar quickly. Medium-GI foods have a rank of 55 to 70, while low-glycemic foods have a score of less than 55 and raise your blood sugar gradually. Granulated sugar is has a moderate rating of about 60 to 65. Opt for a lower-GI sweetener instead. Honey ranks at around 50 on average, with some types rating as low as 35. Agave nectar has a rating of 11 to 19, depending on the variety. These lower-glycemic sweeteners might be better alternatives to include in your diet if you're managing your blood sugar. If You Are Borderline Diabetic, How Much Sugar Can You Have Per Day? How Many Carbs & Calories in Vodka?